I really like the card challenges over on the Poetic Artistry blog. This is challenge number 31. She always has such nice sketches and card samples! I decided to use some paper I bought a while back from Eclectic Paperie. I unfortunately don't know who it's by. I used Rose Red as the card base and matted the designer paper to it. I used the Swiss Dots folder Old Olive & Rose Red pieces of cardstock. 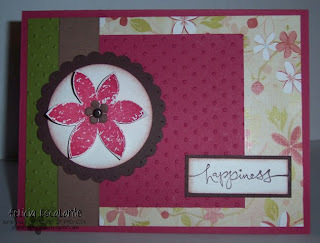 I stamped the flower from Bud Basics in Rose Red then I cut it out to give it some dimension. A vintage brad was inserted in middle of a brown prima flower and finally through the cut out flower. It was matted on a scallop circle.